President Trump has issued an executive order limiting immigration from seven different majority Muslim countries. WASHINGTON, D.C. (KTRK) -- Confusion, worry and outrage grew Saturday as President Donald Trump's crackdown on refugees and citizens from seven majority-Muslim countries took effect. 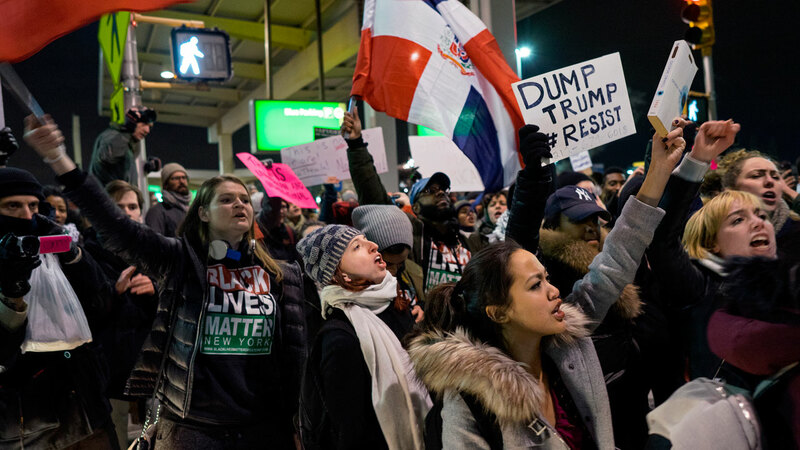 Airlines blocked people traveling to the United States, legal challenges were underway and doubts abounded about whether the order would make America safer. The immediate fallout from Trump's order meant that an untold number of foreign-born U.S. residents now traveling outside the U.S. could be stuck overseas for at least 90 days - despite holding permanent residency "green cards" or other visas. And some foreign nationals who were allowed to board flights before the order was signed Friday were being detained at U.S. airports, told they were no longer welcome. Hundreds of people at points of entry (airports, seaports, land border crossings, etc.) both in the U.S. and overseas have been denied entry into the country, a source familiar with the matter told ABC News. The vast majority of those denials have been for passengers traveling by air. ABC News can confirm 27 denials of entry or detentions at at least four major American airports (John F. Kennedy in New York, Chicago O'Hare, Philadelphia International and Dallas-Fort Worth International) on Saturday, although authorities expect those numbers to rise. Demonstrators gathered on Saturday afternoon to protest President Trump's immigration policy. Multiple sources say that beyond the executive order itself, the Trump administration has sent no further guidance to agencies about how to implement this order. Sources describe it as a scramble to implement the order. One source notes that usually before issuing executive orders affecting operations across government, administrations engage in a months-long process consulting with relevant agencies that did not happen with this executive order. The order drew criticism from U.S. lawmakers and officials around the globe. Sen. Ben Sasse, a Nebraska Republican on the Senate Armed Services Committee, said while Trump is right to focus on border security, the order is "too broad." Hameed Khalid Darweesh and Haider Sameer Abdulkhaleq Alshawi were detained by immigration officials after landing at New York's Kennedy airport Friday night. Darweesh had worked as an interpreter for the U.S. Army when it invaded Iraq in 2003. Later he worked as a contract engineer. He was allowed into the U.S. Saturday afternoon, hours after his attorney petitioned a federal court to let the two men go. In their court filing, his lawyers said Alshawai's wife had worked for a U.S. security contractor in Iraq. Members of her family had been killed by insurgents because of their association with the U.S. military. "There is no evidence that refugees - the most thoroughly vetted of all people entering our nation - are a threat to national security," said Lena F. Masri, the group's national litigation director. "This is an order that is based on bigotry, not reality." John Cohen, a former Department of Homeland Security counterterrorism official who worked under Democratic and Republican administrations, said the order didn't address America's "primary terrorism-related threat" - people already in the U.S. who become inspired by what they see on the internet.